I know from previous comments that many of you have a sewing machine tucked away gathering dust. 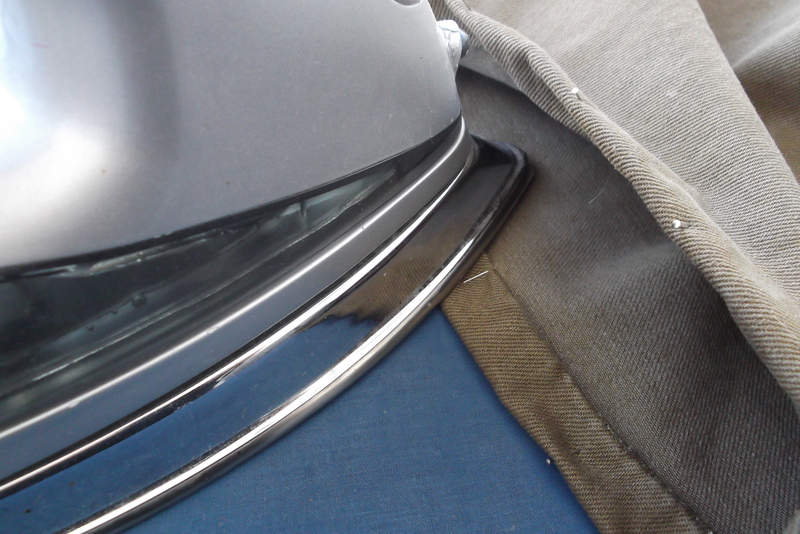 Perhaps you´ve mastered a straight seam on your machine, but not really progressed beyond that. Well, fear not, your machine will now be able to pay you back and save you the expensive costs of having to take too long jeans or chinos to the tailors for adjusting. I know that whenever I´ve taken the “lazy” route I´ve thought “How much? Crikey, that´s almost what I paid for the trousers!” Also, when I buy something new, I want to wear it RIGHT NOW and not a week on Wednesday. So…grab yourself a pair of long jeans, your dusty old machine and half an hour of your time and you´ll be set to go stepping out in your lovely new trousers. Start by unpicking the old seam. Don´t skip this step, you don´t want a huge bulky hem swinging round your ankles now do you? Measure the length of the original hem (where the hem hit the floor to the cut edge of the fabric) and take note of this measurement. Let´s call it A. Now measure your inside leg. A handy friend or loved one who you can trust intimately with this is useful! 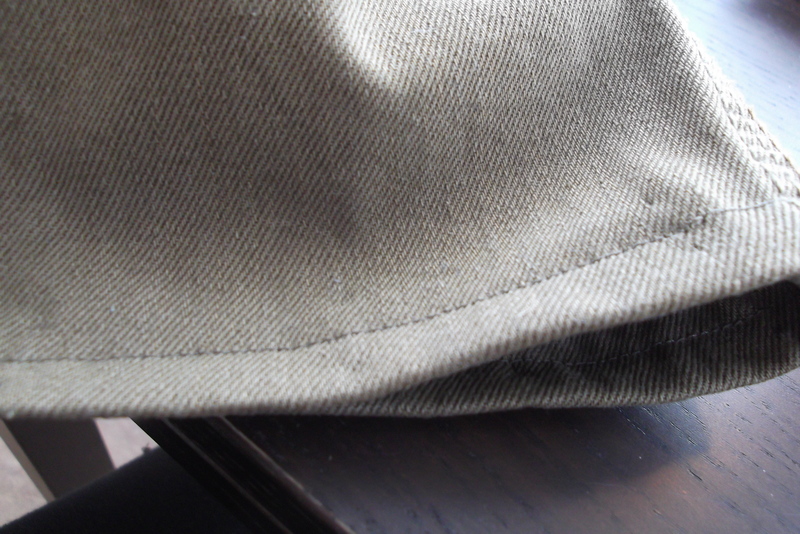 Otherewise measure a pair of trousers that fit well along the inside seam from the centre join to the floor. This is measurement B. Now put a pin in your new trousers at measurement B from the inside leg top seam and then another pin the distance of A from the first pin. If your trousers are only an inch too long, you´re in luck. Your cutting line will probably be the old base line of the original trousers. If it´s different, add a few pins or mark with tailors chalk or even biro (you won´t see this when you´re finished) all the way round and cut the bottom off. Don´t try and be clever and cut through both sides at once. Apart from hurting your hands when you cut, you´ll probably end up with a wonky edge. Cut upwards to the line then round. Don´t throw these little strips away, they will be useful in a moment. 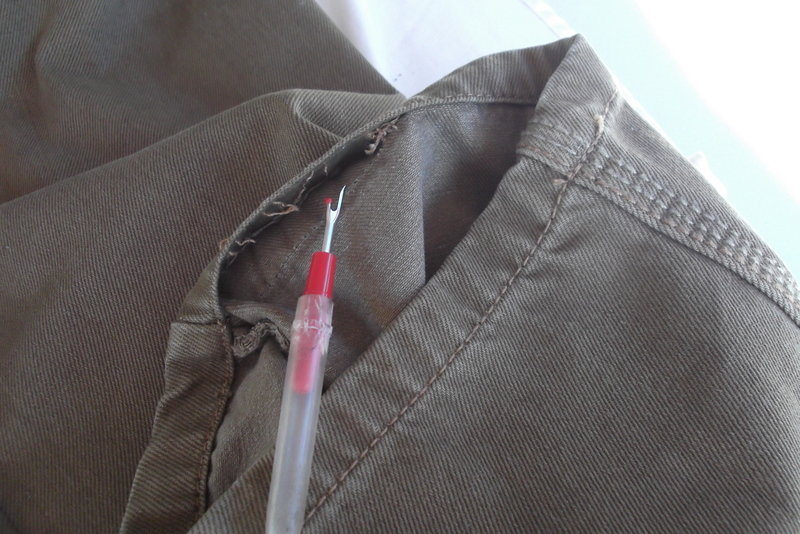 Now do a double fold up to the B pin mark and either pin or pin and tack (baste) your trousers. Try them on again! You´re about to sew them, so you want to be sure you´ve got it right. Now iron the bottoms from the inside. Don´t skip this step either, it will make sewing so much easier! 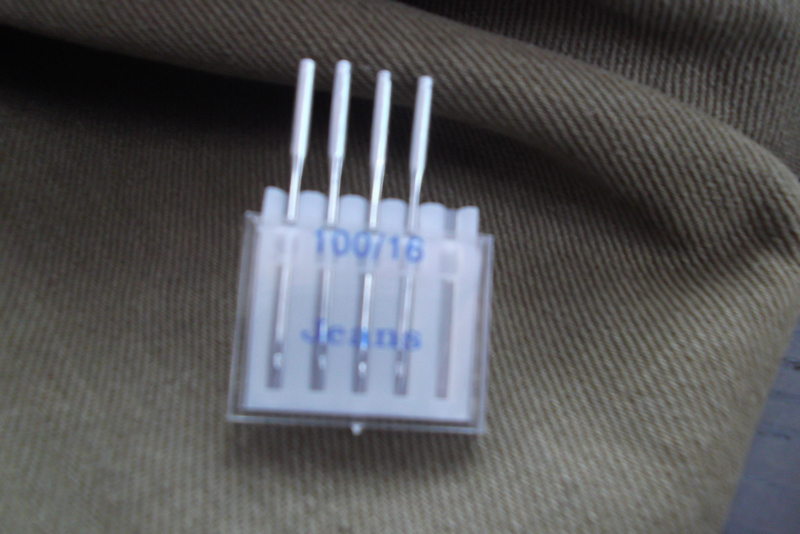 I recommend using a heavy duty needle – a pack of 5 only costs about a euro here, hopefully they´re not expensive where you are and you´ll get a much better result. Either match the thread to the existing stitching or find something close to the colour of your fabric. Now you´re going to just have a little play with those strips of material you saved. Stitch along on one of these strips, checking the colour and stitch length. Take the wide extension piece off the machine if you have one (Sorry, I don´t know what it´s called and I never use mine) so that you can slip the trouser bottom straight onto the machine ready to stitch. 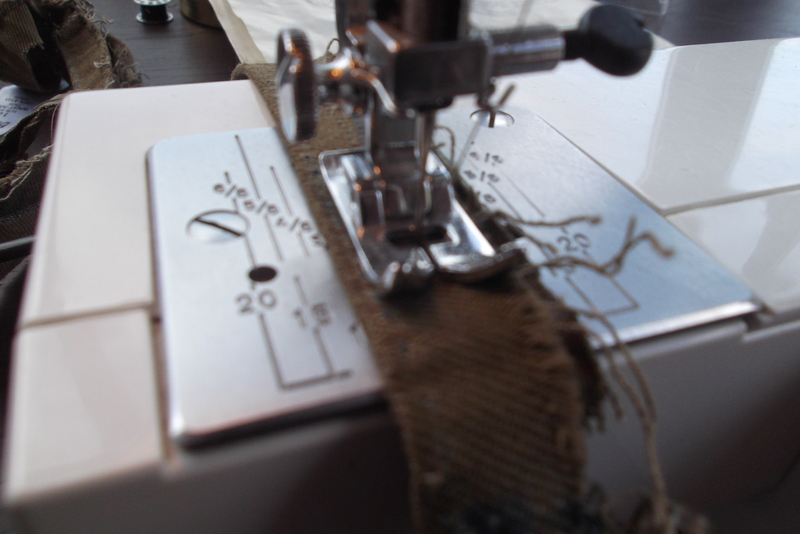 Start stitching – I recommend you start just before the inside leg seam so that you are sewing the back first. In this way, if anything does go wrong (but it shouldn´t!) it´s less noticeable. Sew right round, cut your threads and admire your lovely new hem. Don´t forget to remove the heavy duty needle and replace with the usual one. PS. 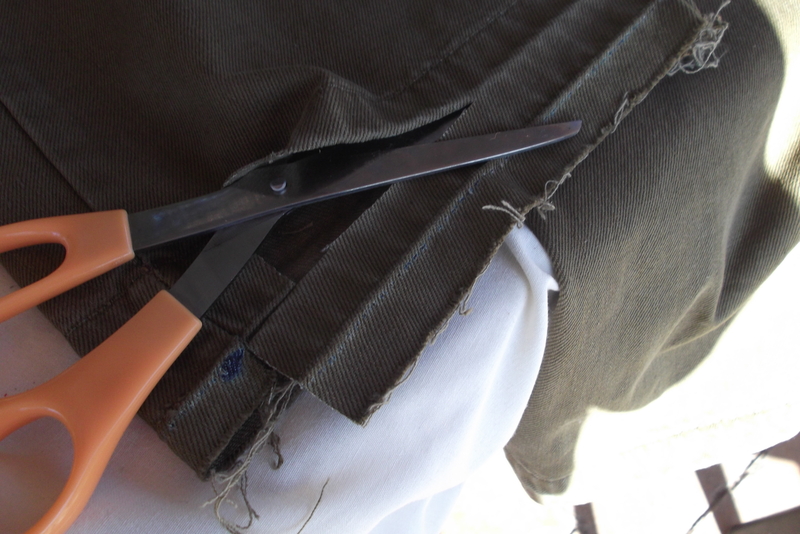 Shortly after making these adjustments (to Big Man´s trousers) He Broke My Very Special Left Handed Dressmaking Scissors!!! He said he wondered why they didn´t cut the plastic cabling he was trying to chop….I am trying to be understanding but He Broke My Very Special Left Handed Dressmaking Scissors!!! I´ll be over it soon. Maybe. We have a sewing machine, bought from Lidl’s at a bargain price, that I challenge even a highly qualified engineer to thread and use. Jenny and I have succeeded a couple of times as a dual effort, but neither of us knows how we did it. We once had a beautiful old Singer treadle sewing machine that we lent to “friends”, who then sold it! Oh dear – and sometimes even the “instructions” just add to the confusion! I also had a beautiful old treadle machine that “disappeared” on one of my many house moves. He. Touched. Your. Sewing. Scissors. !!!!!!!!!!!!!!!! The Husband learnt that lesson very quickly. Wow…I’d have been whopped with a hairbrush if I’d used my Mom’s sewing scissors to cut PAPER! Great tutorial…I gave my machine to my daughter last year, and will pass this link on to her. Hope your daughter finds is Handy. And am now off to get my hairbrush! Hurrah for your Mum…unfortunately mine can´t really sew, so I had to learn myself! He is being suitably ashamed of himself! That doesn’t sound a very good return for taking up his trousers! Maybe when he buys you a new pair of Very Special Left Handed Dressmaking Scissors he can also buy himself a pair of Plastic Cable Cutting Scissors! Or maybe I can just shave my legs with razor….! Zia is left-handed so I know just how great a loss you’ve suffered. I cannot and do not sew. In fact, it would take me hours to just find a needle and thread, let alone attach a button. I do, however, cook on occasion and last night I followed your spicy prawns recipe. It was delicious! Crusty bread is a must. You’ll want to enjoy every last bit — and I did! Thanks, Tanya! Being left handed does present a few challenges in life from time to time! Glad the prawns were good. Did you save me a little crust of bread?! Glad it prompted some good memories, but you´re right, it´s a dying art. Years ago it was cheaper to make your own – now it´s a luxury! Great tips and detailed instructions! I had to smile as I remember ruining so many of my mother’s needles on trying to sew through heavy jean material!! Hi Chica. Oh no! not your dress making scissors! Your post reminded me of the first dress making scissors I ever bought. I saved up for weeks to buy them. I took a bit each week out of my £28! a week wage. I came home from work one day to find my dad cutting a carpet with them!!!!! I cried! Oh dear, that´s awful. Mine weren´t all that fantastic but carpet cutting…honestly!! I just walk on the bottom of my pants. Hmm, maybe one day I should stop doing that! Bet you sewed your cooking badge onto your sleeve! I think learning to sew was part of a sewing and cooking badge (maybe handicrafts). I think I did it too in Brownies … happy days! Since I’m what they call petite, I won’t buy a pair of pants unless they are from a special petite department, which by the way is getting harder and harder to find. I can sew but everything about clothes designed for tall (or should I say normal height people) just never fits properly even after alterations. I can’t wait to see what you make from the lovely fabric that you brought back for holiday. You´re so right – I´m probably petite and plus size (i.e. short and wide!) so have similar problems. 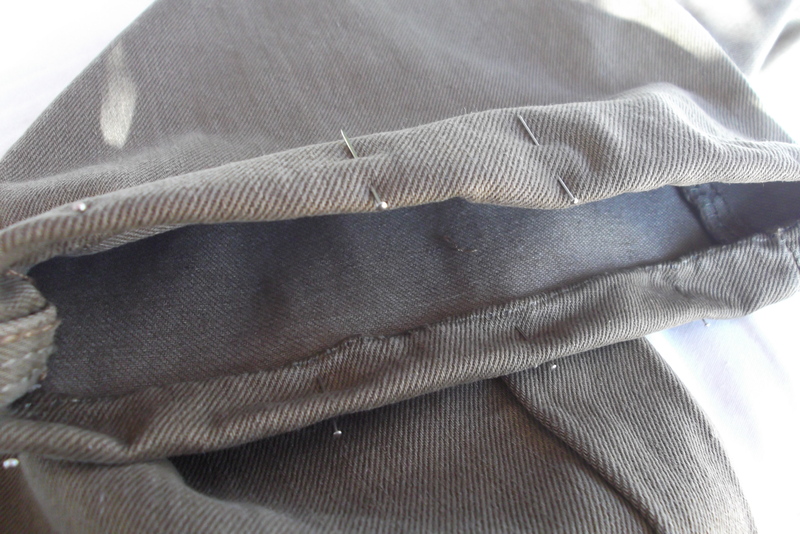 Am actually making my first pair of proper trousers (pants) with zips and hopefully all properly fitted. Am hoping this will be the “template” for future amazingly fitted trousers! Hope she finds it useful – although she may well already be an expert! Hmm, I don’t ever have to take up a hem, as I very seldom find a pair of pants that are just long enough! Now, in our house, we have his and her scissors and the communal ones are known as her scissors too – just in case! But you do this (and probably much better) already! Hi Chica, I am so happy I came across your tutorial, I actually wasn’t too far off the mark, which is nice to know! 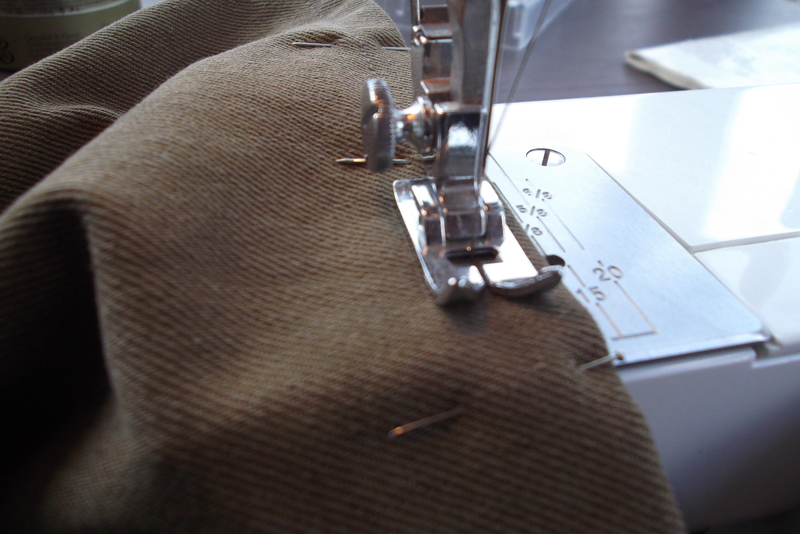 Apart from hand-stitching the hem’s on my school uniform back when I was 12, (taught by Mum of course!) I actually never tried hemming on a sewing machine until this year when my husband started opting for work pants made of more “hard-wearing” material. Of course hand-stitching the hems on those just wasn’t going to cut the mustard. Think my confidence has increased with each pair of pants as last night I tackled a pair of Chino’s last night. I had to disassemble the hem as it looked a little more difficult than previous hemming projects, and was quite pleased with the end result. Hello Mrs Martin and thanks for stopping by and commenting. So pleased this tutorial was useful to you. I guess we all have our own little ways of doing things, but itñ´s great to share ideas! 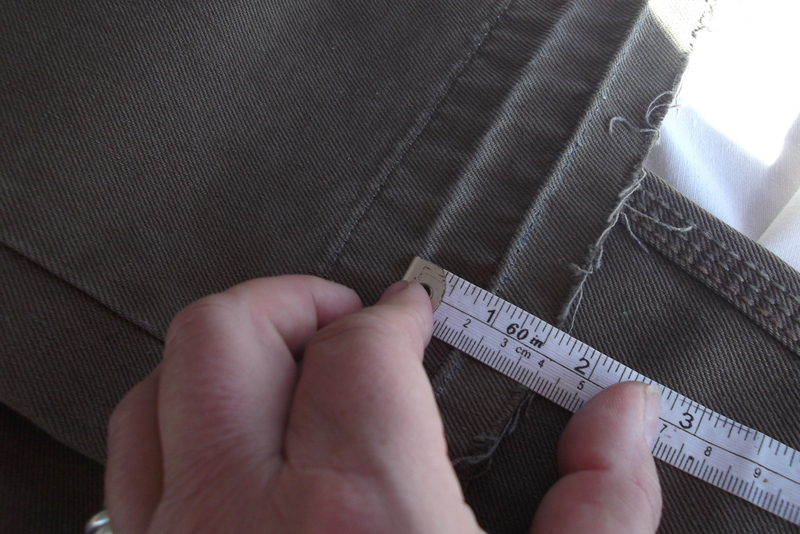 I have never needed to take in too wide trousers, but my recommendation would be to unpick the less wieldy seam (one is usually thicker than the other) up to where you need to take them in and then pin, try on, baste, try on again and then sew. If you´re not taking them in too much this should not affect the fall of the trousers. Hope this helps!